Mixing rustic materials with clean lines, this low profile bed exudes modern rustic industrial style. The bed is constructed from solid wood and finished in a gray pine color that's natural, rustic look is enhanced by sandblasting, wire brushing, and saw marks for a reclaimed feel. 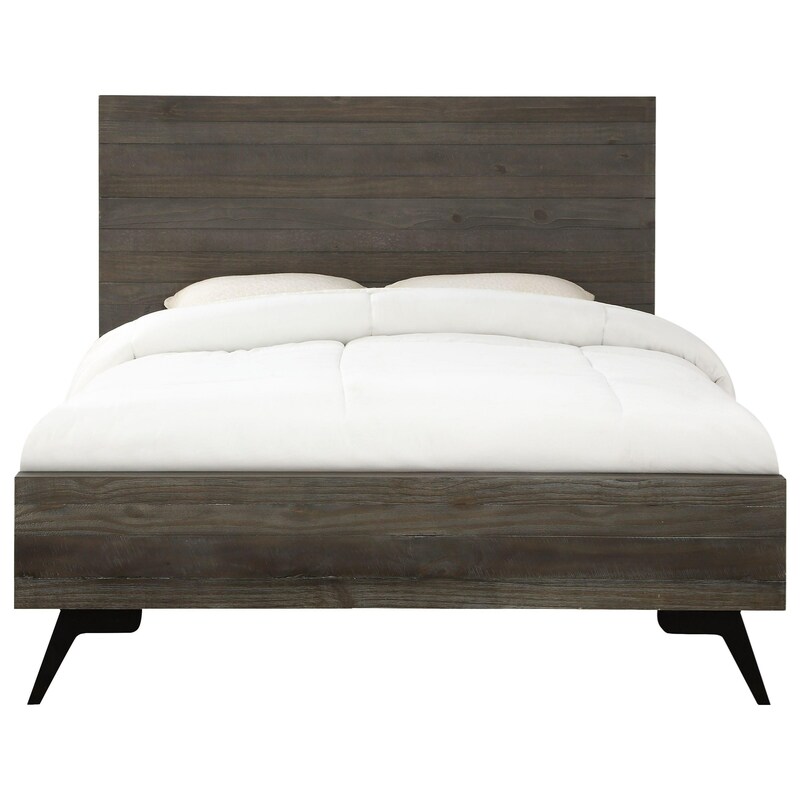 Splayed metal legs add industrial appeal and highlight the bed's minimalist shape. The Nevada Queen Low-Profile Solid Wood Bed by Modus International at Michael's Furniture Warehouse in the San Fernando & Los Angeles area. Product availability may vary. Contact us for the most current availability on this product. 2H64P5BH Headboard 1 0" 0" 0"
2H64P5FB Footboard 1 0" 0" 0"
2H64P5R Rails 1 0" 0" 0"
Case Construction Solid wood construction. The Nevada collection presents an updated take on rustic industrial style. Crafted from solid wood, each piece is then treated with sandblasting, wire brushing, and saw marks for an authentically rustic look and feel. Clean lines capture minimalist modern style, while the splayed metal legs add industrial appeal. The Nevada collection is a great option if you are looking for Rustic Contemporary furniture in the San Fernando & Los Angeles area. Browse other items in the Nevada collection from Michael's Furniture Warehouse in the San Fernando & Los Angeles area.